Don't have time to host a party? Maybe building a bear just isn't your thing. Well, you can still help. You can mail us a tax-deductible donation or you can contribute online. 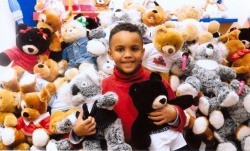 A suggested donation of $20 allows us to buy one bear to stuff & give to a needy child in New Jersey, but we appreciate any contribution you can give. What a wonderful way to get your children involved in the process of giving! All you need is a minimum of six children to host a charity party. Contact the Bridgewater, NJ location to learn more about setting up a party. Be sure to mention that your bears are going to The Justin Charity Bear Fund. A nice way to bond with your child or children and give back to kids in need. Just stop by the Build-A-Bear store in Bridgewater, NJ and be sure to mention that the bear is going to The Justin Charity Bear Fund. Tell your friends and family about our cause. Post our flyer or press release at your work, local library or municipal building. Please tell us where you distribute flyers. Our flyer and press release can be found on the In the News page.